Cerbat Mustangs are beautiful and strong horses that are used for riding or as an event horse in competitions. They have excellent endurance and are very strong. They are smaller in size than some breeds, but still remain durable and willing to please. They well known for their unique ability to easily reproduce at very late ages. The Cerbat mares can still reproduce well into their twenties, which is a great strength considering some horse breeds only live up until they are twenty. Most of them of have a vertebrae with five lumbar, which is also unusual. Cerbat horses are a part of history, much like the rest of the Spanish routed variations. 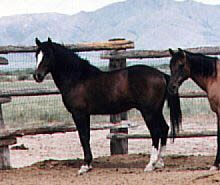 They have been commonly referred to as Spanish Mustangs and are considered rather unique animals. North Americans have continued to develop this particular breed for their athletic strengths and their aesthetic beauty. The ir ancestors migrated to the United States with the Conquistadors. Some experts believe these horses were routed in the southern lands of Spain and some even speculate the possibility of Africa playing a role in their history. They were special because they were thought to be a vital piece of culture as they derived during the Golden Age of Spain. They successfully survived a time period where they were under threat of extinction, a sentence they have currently sidestepped. As their popularity continues to grow even now, they will flourish in reproduction since they're such great horses to own. Cerbats are rugged but rather calm considering the conditions that their ancestors lived in. Storms and other various types of poor weather, as well as trotting on boulders and rough brush for long periods of time, are just some of the things they can withstand as a result of their tough exterior persona. Caring for a Cerbat horse is not very difficult. These are very well trained animals from birth and can survive basically on their own in the wild in the mountains. If you consider using your Cerbat horse for any event competitions, they will need additional care and training. They can live virtually anywhere as their endurance, combined with their tolerance for extreme conditions, continues to prevail, making them an excellent addition to any climate.